A woman with a varied background, both in experience and ethnicity, Jeanette helps with the tables every Wednesday. As a child she helped out at her grandmother’s side. 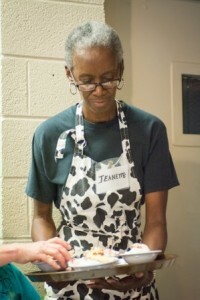 Jeanette’s grandmother was a devoted child of God and Jeanette credits her grandmother with guiding Jeanette to be of service in the community and the church. 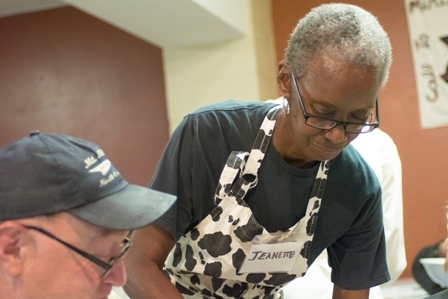 Jeanette’s first visit to The Haywood Street Congregation happened when she followed a friend for lunch. Now, she comes because she feels at home at the active church. In her experience, she has served in many ways, not because she wants to be known as someone who is able to serve, but because she believes in the message of God. The specific religion is not what is most important to Jeanette, the action of giving is important. 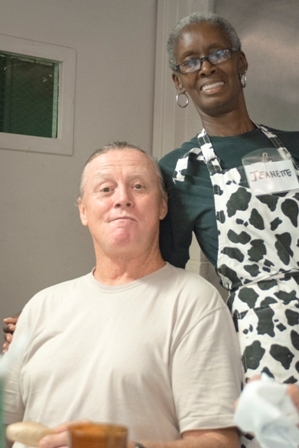 Jeanette helps with prison ministry, and has encountered people who do not want to believe in a God. She tells them “When you look at me you are looking at walking, living proof that there is a God”.